The Master of Teaching (Secondary) equips graduates with an accredited professional teaching qualification by TEQSA and NESA (formerly BOSTES). Do you love young people and get a thrill when you see the lights go on in their hearts and minds? Do you connect with the youth in your church? Are you excited about working with young people reaching for their dreams? Are you keen to equip your own future with our professional qualification to teach in Independent or Public Secondary Schools? This program is for graduates who sense a calling to secondary school teaching and have an appropriate undergraduate degree from a recognised institution. We take students at pre-service level and current teachers seeking to upgrade their qualifications. Our Master of Teaching (Secondary) is a new program for us but why not hear and read what some of our students are saying about our current program? We are passionate about tailoring our learning and teaching to students’ individual needs, in small classes where each student is known and mentored by their subject’s lecturer. Students are never a number! Our signature delivery style is blended learning, where students come on campus for their one week’s face-to-face seminar for each subject and complete the remainder of their study online. However, all of our subjects can now be studied fully online, with the exception of the professional experience placements which require 60 days in schools. The Master of Teaching (Secondary) is a two year program (4 subjects per semester full-time). Each student must take two disciplines made up of two curriculum subjects each totalling four subjects over the two years. 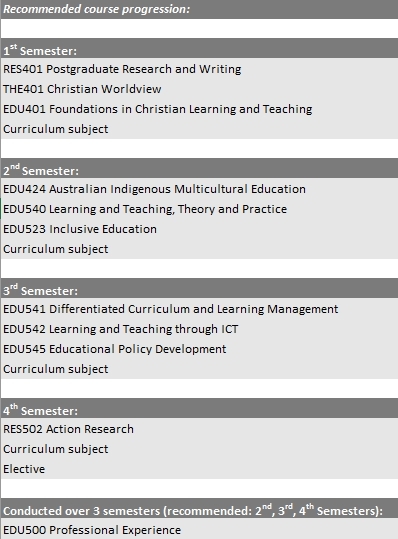 These subjects will qualify the student to teach up to Year 12 in their two chosen disciplines. In order to be eligible to take their two chosen disciplines they must meet the pre-requite demands from their bachelor degree qualifications. The students’ degree transcripts will be reviewed to confirm eligibility to study the selected disciplines. Students must complete 10 credit points in Professional Experience. If English is not the applicant’s first language or if their first degree was awarded in a non English speaking nation, they will be required to show proficiency in the International English Language Testing System (IELTS) (or equivalent). Such students admitted into our programs must attain an overall IELTS (or equivalent) score of 7.5 (with no score below 7 in any of the four skills areas, and a score of no less than 8 in speaking and listening), on entry into the program. For full details of the policy on the ‘English Language Proficiency for Teachers see the NSW Education Standards Authority - English Language Proficiency Policy. For more detail read the program standards of the Australian Institute for Teaching and School Leadership (AITSL) and the requirements set by the NSW Education Standards Authority (NESA). This course requires a complete Bachelor degree awarded under the Australian Qualifications Framework (or equivalent overseas qualification). Applicants with Recent Secondary Education are not eligible for direct entry into this course. This course requires a complete Bachelor degree awarded under the Australian Qualifications Framework (or equivalent overseas qualification). Applicants with a Vocational Education and Training qualification are not eligible for direct entry into this course. This course requires a complete Bachelor degree awarded under the Australian Qualifications Framework (or equivalent overseas qualification). Your degree must include the pre-requites for your chosen curriculum subjects. This course requires a complete Bachelor degree awarded under the Australian Qualifications Framework (or equivalent overseas qualification). Applicants with Work and Life Experience are not eligible for direct entry into this course. Domestic Applicants: Domestic students studying in Australia are required to complete the Working with Children Check online upload a copy to their application for admission. Applicants are classified as a ‘volunteer’ in Education. International Onshore Applicants: International students studying in Australia are required to complete the Working with Children Check online prior to enroling into a Professional Placement. Applicants are classified as a ‘volunteer’ in Education. International Offshore Applicants: International students studying outside of Australia are not required to complete a Working with Children Check. Both Domestic and International Onshore applicants are required to complete the online Anaphylaxis e-training module. Participants will receive a certificate of completion that is to be uploaded as part of their application for admission. Applicants can select ‘schools course’. International Offshore Applicants: International students studying outside of Australia are not required to complete the online Anaphylaxis e-training module. Individual support is available for any questions you might have about your application, don't hesitate to ask. Please contact the Program Director, Dr Jim Twelves, by email, phone (02 8893 9000) or by appointment, for academic advice at this stage. The Australian Government introduced a national Literacy and Numeracy Test for Initial Teacher Education Students (LANTITE) from 2016. They argue that well trained, skilled and knowledgeable teachers provide the foundation for a high-quality education system in which every Australian student receives excellent teaching. The LANTITE for initial teacher education students is designed to assess initial teacher education students’ personal literacy and numeracy skills to ensure teachers are well equipped to meet the demands of teaching and assist higher education providers. AC requires all pre-service teachers to sit and pass the LANTITE prior to their final professional placement. LANTITE is mandatory for professional teacher registration in Australia.